Yosemite National Park is one of the most well-known and appreciated national parks the United States has to offer. From the time of the famed naturalist John Muir until now, millions of people have been left in awe at the natural wonder and majesty of the sheer granite cliffs, massive stands of old-growth forest, abundant wildlife, and dozens of other examples of pure, natural beauty that Yosemite offers. Unfortunately, the majority of visitors to Yosemite National Park never make it beyond the famed and enchanting Yosemite Valley. Below, we offer advice on the top five attractions at Yosemite that are relatively unknown and will allow you to say you’ve had the complete Yosemite experience. These include the Yosemite must-see list and the best Yosemite hikes. While the valley is home to the most iconic, postcard-like images of Yosemite, over 95% of the park is wilderness area that almost no one ever visits. If you are planning a trip to Yosemite, check out this complete guide to the park to help you plan your vacation. While the famous naturalist John Muir is often credited for his lifelong dedication towards defending the natural beauty of Yosemite and eventually helping it be turned into a national park, long before Muir the Ahwahnee indigenous people lived and cared for the land. For folks interested in the history of the region and how its original inhabitants carved out a way of life that revered and protected the natural wonders of the mountainous landscape, a trip to the indigenous village of the Ahwahnee is well worth your time. One of the most appreciated panoramic views of Yosemite National Park is at Glacier Point which anyone with a car can drive up to. During weekends especially, you will usually find a host of tourists and picture takers all vying for the best spot. If you want a little bit more seclusion and privacy to enjoy the views at Yosemite, only five miles away is Taft Point. You will have to leave the car and hike about a mile in from the road, but the view is just as impressive without all the crowds. For people wanting a quiet place to meditate and enjoy the otherworldly views of Yosemite Valley, this is the place to head. As we’ve mentioned, millions of people over the years have come to Yosemite to enjoy the views. Ansel Adams, the famed nature photographer made Yosemite one of the center pieces of his work which is esteemed by photographers all over the world. You can also see Yosemite through the eyes (or lens) of Ansel Adams by signing up for a photography walk that leaves from the Ansel Adams Gallery. You can even try to see if your iPhone pictures rival his classic black and white photos. When faced with a decision about which waterfall to see while at Yosemite, most people opt for Yosemite Falls. It is the highest waterfall on the continent, after all. The fact that most people head to see or hike up Yosemite Falls means that the other waterfalls scattered throughout the park are less visited, though no less impressive. Vernal Falls is a spectacular 317-foot waterfall. The hike down and back up is steep and strenuous but the views and the mist on your face will be sure to keep you invigorated during the trek. Not everyone is up for scaling Half Dome or El Capitan, the two most famous peaks in Yosemite. However, located above the enchanting Tuolumne Meadows, Lembert Dome is another massive granite peak that is a little easier to climb than its bigger brothers. The 2.8 mile roundtrip is doable for most hikers, and the views of the surrounding meadows are absolutely stunning. Make it a priority to be at the top near sunset for some fantastic color in the horizon. When planning your trip to Yosemite, make sure you leave enough time on the agenda to go beyond the well-known and overly visited attractions at Yosemite National Park. 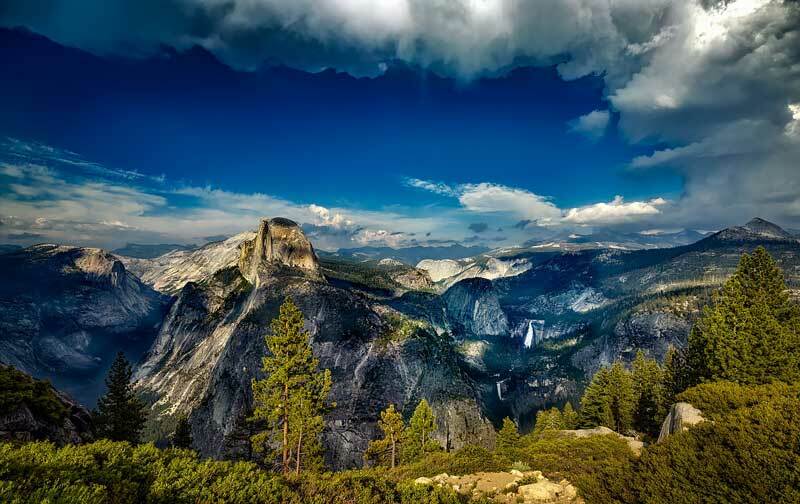 While you should definitely check out Glacier Point, Half Dome, and Yosemite Falls, any one of the top five attractions mentioned above will allow you a glimpse into a side of Yosemite that most visitors are never fortunate enough to see and experience.